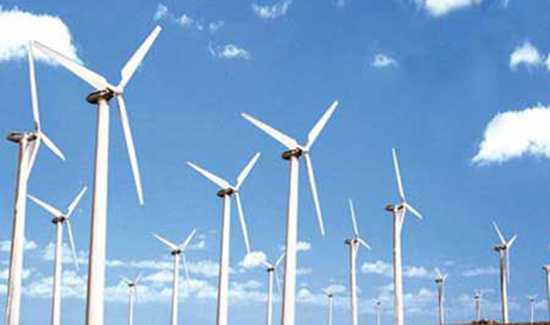 In the wind turbine business there are basically two types of turbines to choose from, vertical axis wind turbines VAWT and horizontal axis wind turbines HAWT. Rotate on a horizontal axis generator mounted at the top. What most of us perceive as normal wind turbine that are now all around us now on wind farms. Revolve around a vertical axis; The main rotor shaft arranged vertically, imagine a cup spinning on pole, fixed blades. 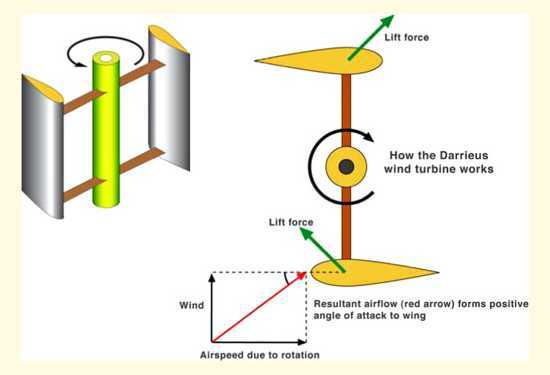 Rely on aerodynamic properties to revolve the turbine know as lift and drag, they spin faster than the wind speed, suitable for electricity generation. The history of wind power shows a general evolution from the use of simple, light devices driven by aerodynamic drag wind power forces; to heavy, material-intensive drag devices; to the increased use of light, material-efficient aerodynamic lift devices in the modern era. But it shouldn’t be imagined that aerodynamic lift (the force that makes airplanes fly) is a modern concept that was unknown to the ancients. The earliest known use of wind power, of course, is the sail boat, and this technology had an important impact on the later development of sail-type windmills. Ancient sailors understood lift and used it every day, even though they didn’t have the physics to explain how or why it worked. The first windmills were developed to automate the tasks of grain-grinding and water-pumping and the earliest-known design is the vertical axis system developed in Persia about 500-900 A.D. The first use was apparently water pumping, but the exact method of water transport is not known because no drawings or designs — only verbal accounts — are available. The first known documented design is also of a Persian windmill, this one with vertical sails made of bundles of reeds or wood which were attached to the central vertical shaft by horizontal struts. Vertical-axis windmills were also used in China, which is often claimed as their birthplace. While the belief that the windmill was invented in China more than 2000 years ago is widespread and may be accurate, the earliest actual documentation of a Chinese windmill was in 1219 A.D. by the Chinese statesman Yehlu Chhu-Tshai. Here also, the primary applications were apparently grain grinding and water pumping. One of the most scenic and successful applications of windpower (and one that still exists), is the extensive use of water pumping machines on the island of Crete. Here, literally hundreds of sail-rotor windmills pump water for crops and livestock. 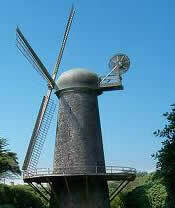 The first windmills to appear in western Europe were of the horizontal-axis configuration (HAWT). The reason for the sudden evolution from the vertical-axis Persian design approach is unknown, but the fact that European water wheels also had a horizontal-axis configuration — and apparently served as the technological model for the early windmills — may provide part of the answer. Another reason may have been the higher structural efficiency of drag-type horizontal machines over drag-type vertical machines, which (remember) lose up to half of their rotor collection area due to shielding requirements. The first illustrations (1270 A.D.) show a four- bladed mill mounted on a central post (thus, a “postmill”) which was already fairly technologically advanced relative to the Persian mills. These mills used wooden cog-and-ring gears to translate the motion of the horizontal shaft to vertical movement to turn a grindstone. wind power This gear was apparently adapted for use on postmills from the horizontal-axis water wheel developed by Vitruvius. As early as 1390, the Dutch set out to refine the tower mill design, which had appeared somewhat earlier along the Mediterranean Sea. The Dutch essentially affixed the standard post mill to the top of a multi-story tower, with separate floors devoted to grinding grain, removing chaff, storing grain, and (on the bottom) living quarters for the windsmith and his family. Both the post mill and the later tower mill design had to be oriented into the wind manually, by pushing a large lever at the back of the mill. Optimizing windmill energy and power output and protecting the mill from damage by furling the rotor sails during storms were among the windsmith’s primary jobs. 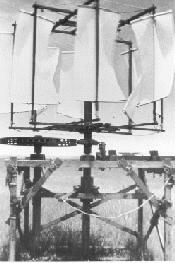 A primary improvement of the European mills was their designer’s use of sails that generated aerodynamic lift(see Figure 4 at the left). This feature provided improved rotor efficiency compared with the Persian mills by allowing an increase in rotor speed, which also allowed for superior grinding and pumping action. The process of perfecting the windmill sail, making incremental improvements in efficiency, took 500 years. By the time the process was completed, windmill sails had all the major features recognized by modern designers as being crucial to the performance of modern wind turbine blades, including 1) camber along the leading edge, 2) placement of the blade spar at the quarter chord position (25% of the way back from the leading edge toward the trailing edge), 3) center of gravity at the same 1/4 chord position, and 4) nonlinear twist of the blade from root to tip (Drees, 1977). wind powerSome models also featured aerodynamic brakes, spoilers, and flaps. 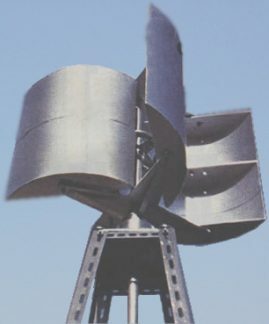 The machine shown in Figure 4 (which was operating with two of its buddies pumping water about one meter up from one irrigation pond to another in the Netherlands in 1994) features leading edge airfoil sections. These mills were the “electrical motor” of pre-industrial Europe. Applications were diverse, ranging from the common waterwell, irrigation, or drainage pumping using a scoop wheel (single or tandem), grain-grinding (again, using single or multiple stones), saw-milling of timber, and the processing of other commodities such as spices, cocoa, paints and dyes, and tobacco. While continuing well into the 19th century, the use of large tower mills declined with the increased use of steam engines. The next spurt of wind power development occurred many thousands of miles to the west. For hundreds of years, the most important application of windmills at the subsistence level has been mechanical water pumping using relatively small systems with rotor diameters of one to several meters. These systems were perfected in the United States during the19th century, beginning with the Halladay windmill in 1854, and continuing to the Aermotor and Dempster designs, which are still in use today. 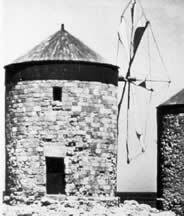 Most of these mills had tails to orient them into the wind, but some were weather-vaning mills that operated downwind of the tower. Speed control of some models was provided by hinging sections of blades, so that they would fold back like an umbrella in high winds, an action which reduced the rotor capture area to reduce thrust. The most important refinement of the American fan-type windmill was the development of steel blades in 1870 (Figure 5). Steel blades could be made lighter and worked into more efficient shapes. They worked so well, in fact, that their high speed required a reduction (slow-down) gear to turn the standard reciprocal pumps at the required speed. Between 1850 and 1970, over six million mostly small (1 horsepower or less) mechanical output wind machines were installed in the U.S. alone. The primary use was water-pumping and the main applications were stock watering and farm home water needs. Very large windmills, with rotors up to 18 meters in diameter, were used to pump water for the steam railroad trains that provided the primary source of commercial transportation in areas where there were no navigable rivers. 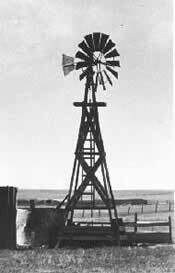 In the late 19th century, the successful “American” multi-blade windmill design was used in the first large windmill to generate electricity. Having increased ninefold in total capacity since the start of the twenty-first century, wind power is quickly solidifying its position as an important part of the global energy mix. As governments look to reduce dependence on price-volatile fossil fuels and to cut carbon emissions, wind—a widespread, abundant, and inexhaustible resource with zero fuel cost—is becoming an increasingly attractive option. In a 2009 study of world wind resources, Harvard University scientists concluded that the top 10 carbon dioxide-emitting countries could satisfy all of their electricity needs using wind alone. The world will of course use a variety of technologies to meet future energy demand, but these findings leave no doubt: the potential for wind power to replace fossil fuels and take a leading role in stabilizing climate is huge.